Zions Bank heard Mark’s story a few months ago and felt impressed to have him shared with many people in their area. Fortunately, I was able to spend two days in the Salt Lake City area last week talking about Mark. And when I talk about Mark, I must talk about the many other great men we’ve met this past year, who serve our country selflessly. Each group I presented to was made up of high quality Americans. These were men and women who are big supporters of veterans. They are active in the community, and most were not only supportive of military affairs, but were veterans themselves. Below is the display honoring Mark in the downtown Salt Lake City Zions Bank lobby. This is their flagship branch. To the right of Mark’s display were two other displays of men who served in WWII and Vietnam. One of them came home alive, the other was killed shortly after extending his stay in Nam. Short video of his display a few sections below. Below, the foundation is presenting Steve Bartholomew a portrait to show our appreciation for his support of Mark and his foundation. Steve made the initial contacts at Zions to make it possible for me to share Mark’s story. We can’t thank him enough. He is passionate about great Americans, such as Mark. The link below is a letter that Steve wrote to try to sum up his feelings after Mark’s death. He only met Mark once, but his example and sacrifice have never left him. This letter is called “An Open Letter” because it’s not to any particular audience, yet it applies to us all. It’s very well written. As you read, see what impressions you have about a particular Airman, Soldier, Marine, Sailor, or just heroes in general. Below is Rozlynn and I presenting Brian Garrett of Zions Bank a picture of Mark to show our appreciation to him for his support of the foundation. Brian is a retired Airman and is active in military affairs in the Salt Lake area. Thanks to him, I plan to get another chance to speak to additional groups in Utah in 2012. Thanks to Brian and Steve, many people heard details of Mark and several of his teammates, in preparation of Veteran’s Day. Also pictured is Steve Bartholomew. Zions Bank requested that they keep Mark’s display up thru Tuesday, 11/15. 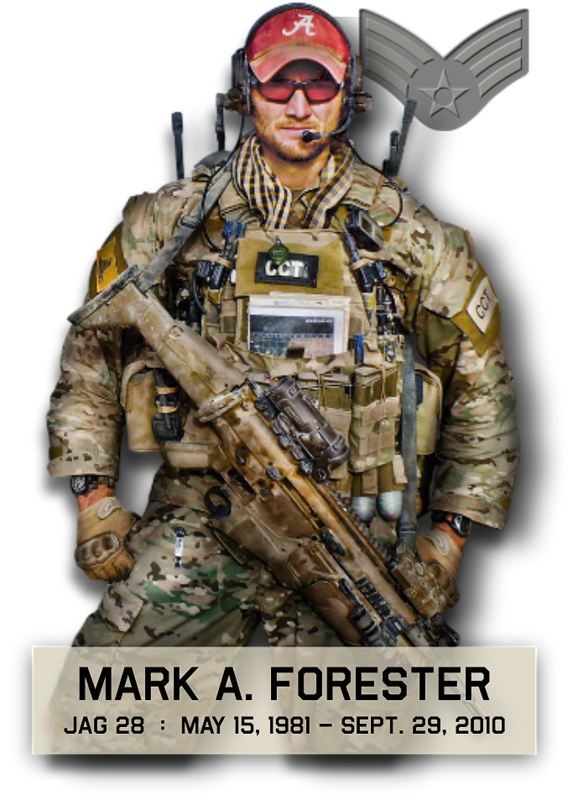 These people in Utah, as well as Alabama and all throughout the country will hear more and more about Mark Forester. For those who attended, thank you for your support. And thanks for wearing Mark’s bracelets. Below is a short video of Mark’s uniform display at Zions Bank. This is a short video showing the display of Marine Cpl. John Telford. It is touching and worth every bit of the 16 secs. From what we understand, his mom is an employee of Zions. John served in Vietnam and extended his deployment. Unfortunately he was killed during that extension. We were also impressed with the respect and honor the TSA showed us at the Birmingham Airport when we flew out last week. They knew we had some of Mark’s belongings and we had to make sure everything was treated gently and with respect. They thanked us for his service. The two men who worked with us were veterans themselves, so we thanked them for their service. We were grateful for their support and cooperation at the airport–a place where there typically doesn’t seem to be many cooperative people.